Win a FREE Prize Package! 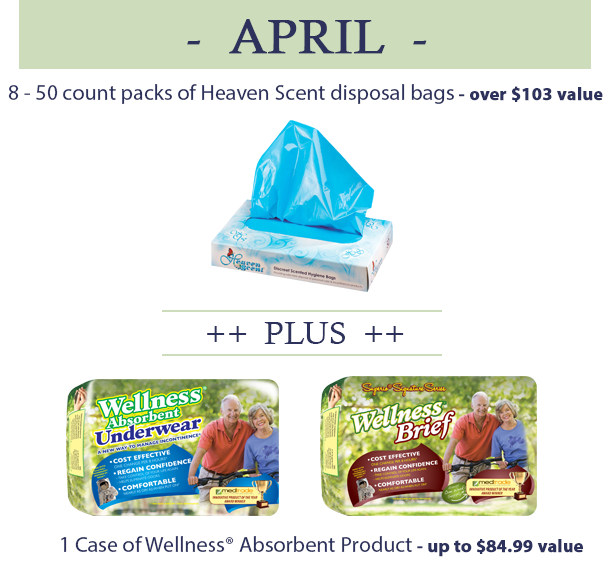 To help those with incontinence confidently get on with life, we’re giving away an entire case of super-absorbent Wellness Briefs and eight packs of Heaven Scent hygiene bags. Each month, we highlight a family caregiver solution that one lucky participant wins — with no purchase necessary and no strings attached! Prizes are products and services that help seniors live more independently and gracefully in their homes. One case of Wellness Brief Superio Signature Series or pull-on Absorbent Underwear. Developed using the same principles as the maximum absorbency garments used by NASA, cost-effective Wellness products can be worn for eight hours, making them perfect for travel and overnight use. Wellness Brief Superio Signature Series absorbs up to 100 fl. oz.! Pull-on disposable underwear fit like regular underwear for discreet protection from bladder leaks. This prize is valued at up to $84.99. Eight packs of versatile Heaven Scent hygiene bags. Powder-scented, opaque bags mask unpleasant odors, making them perfect for disposing of incontinence or feminine hygiene products, pet pick-up, baby diapers and more. Winner receives eight packs, each with 50 bags, together valued at more than $103. Tell us why this prize package would be useful to you or a loved one, and you’ll have a chance to win it! Simply e-mail info@caregiverpartnership.com or snail-mail a short statement. We will accept entries for this prize through April 30, 2015, and will notify the drawing winner the first week of May. Visit the “Helping You Get On With Life” sweepstakes page for the mailing address and other details.